Nokia’s 3310 was the highlight of MWC 2017 as HMD revealed a new version of the feature phone at the biggest phone show in the world – but there’s another 3310 you should know about. 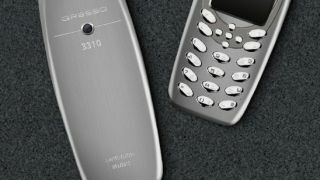 Luxury phone brand Gresso has shared a new version of the Nokia 3310 that costs a whopping $3,000 (about £2,450, AU$3,950). You could have got 18 of the original Nokia 3310's in 2000 for the same price. This isn't the Nokia 3310 we saw at MWC this year or the original phone from 2000 though. It's also currently unclear if Gresso has the rights to use the iconic 3310 name and form factor. The Gresso 3310 mimics the design of the original Nokia phone, but instead of a plastic shell comes with grade 5 titanium body. That's super durable as it can handle drops of 32 feet. The Gresso 3310 comes in either black or titanium grey. As for the camera there’s a 3MP shooter, which even beats the rerelease version of the Nokia 3310 we saw launch earlier this week. Battery wise it’s going to last for 75 hours of talk time while there’s also 32GB of storage onboard. There’s also a dual-SIM so you can use two different numbers at the same time. Gresso has yet to share the rest of the spec for the new 3310, but it seems to have a similar size screen to the original phone. This is a limited edition phone so if you have a lot of money to spend and you want to buy it, you'll probably need to hurry considering how popular the Nokia 3310 is proving at the moment. An actual release date for this version is currently unclear. See how the new Nokia 3310 compares to the phone released in 2000.